Using grasses in perennial schemes is a style that was brought to the forefront of the planting design world by the Dutch plantsman Piet Oudolf. His planting schemes are jaw-droppingly sublime, magical and somehow manage to epitomise nature. This ‘naturalistic style’ of planting evolved through observing how grasses and perennials grew in the wild, concentrating on structure and the textural qualities of each plant. It is this link to nature that appeals to many and is probably the main reason why grasses have become enormously popular today. Piet’s home garden in the Netherlands illustrates the integral role that grasses play in his designs. Sporobolus is sprinkled liberally throughout the Oudolf garden, serving as a matrix plant with its neat habit and airy, see-through plumage. Sporobolus is considered by many to be one of the most refined of all the prairie grasses with a magnificent fountain of fine textured, emerald-green leaves. But the great joy of this plant is that it produces a great cloudy haze of tiny flower heads, held high above the foliage. Sporobolus has a soft, fountain-like look about it. Fine textured, emerald-green leaves, less than 2.5cm (1in) wide, grow as long as 90cm (30in), they cascade out from the centre of the plant and arch downwards. During summer, the leaves are a bright green, they develop rich shades of reddish-gold or deep orange in the autumn, they fade to light copper to creamy tan in winter. In July the plant sends up numerous stalks with delicate, open panicles shooting up over the clump. The pink and brown tinted flowers have a unique fragrance that is said to resemble a cross between coriander and fresh roasted nuts. Later seed heads form, the seeds are highly nutritious and are much sought after by birds. The foliage grows to around 60cm (24in) tall and the same in width and the panicles of flowers reach to 90cm (36in) tall. 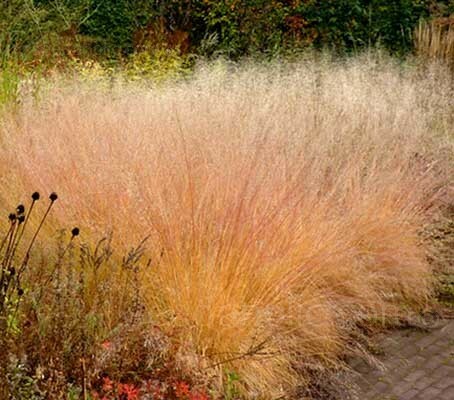 Superficially, the effect is similar to the better known Deschampsia cespitosa, another favourite of Piet Oudolf. 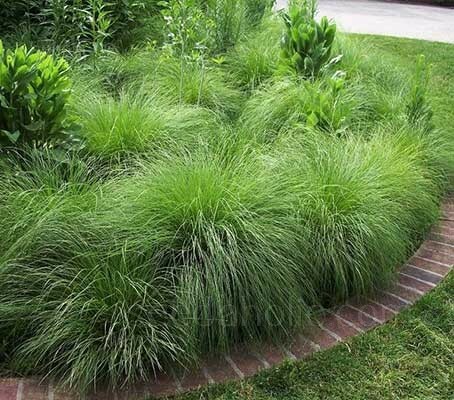 Sporobolus is often planted en masse as a groundcover, it makes a lush, gorgeous lawn alternative with its mounded habit or it can be used as a specimen in the border. Easy, beautiful, and hardy, its soft, fountain-like look makes it one of the most handsome of all the prairie grasses. "Matrix planting is where a single species, or handful of species, dominates the planting, forming a matrix into which other plants are blended.” – Piet Oudolf. 'Matrix' planting is the latest horticultural buzzword, it is also a good word with which to confound other gardeners. When the cognoscenti use it, they refer to a planting which is made up, not so much of groups, as of interwoven communities. Think of the ground covered in a Persian carpet, where you cannot quite see where one colour begins and another ends. There is nothing separate or defined about this method of growing plants. Planting such as this is not, as is sometimes assumed maintenance free. But its maintenance needs are less than more regimented, ‘horticultural’ planting design. What planting like this needs is occasional intelligent intervention rather than constant management. This style – or should it be ‘principle’ – of respectful, ecologically sound, reduced maintenance and visually dynamic practice, is representative of the current wave of advanced thinking within the garden design community. It is not intended to replace the traditional or any other approach; it is there to be explored, advanced and adapted, as genuinely innovative concepts of quality always will be. Experience with these grasses in Holland suggests that they by no means need hot, dry positions, but good drainage is certainly very important. It is easily grown in average, well drained soils in full sun. The grass is tolerant of a wide range of soil types, including heavy clays and is heat and drought tolerant once established, however, some summer watering may be required in arid climates. Sporobolus tolerates a wide range of conditions including clay soil, but grows best in well-drained soil in full sun. It can tolerate light shade, but in too much shade it will flop. It thrives on dry soils and loves the heat. It is potentially a good plant for drought-prone gardens. Sowing: Sow indoors in late winter to early spring or sow in autumn. Sow the seeds on to the surface of a free-draining, moist seed-sowing compost and cover with 3 to 4mm (¼ in) of vermiculite. Keep at around 15 to 20°C (60 to 68°F) Germination should take place in two to four weeks. Maintain a temperature of 15°C (60°F) after germination until the seedlings are established. Once seedlings are large enough to handle, take a small clump of seedlings and put them all in a one-litre pot of gritty compost. They will form a bushy plant and be ready to go into the garden in summer. It is important to give Sporobolus a good start by watering well at initial planting. Supply water the first season, and thereafter it should do well on its own. 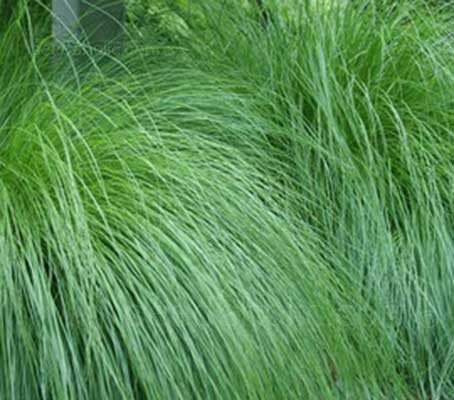 Sporobolus is often planted en masse as a groundcover or as a specimen, several plants can be grown together to create a grassy matrix for hardy perennials or low shrubs. The fact that the leaves do not drop off is an added advantage. For the border, plant 45 to 60cm (18 to 24in) apart. For masse planting plant at a closer spacing of seven plants per square metre. During the first year or so in the garden, take care that plants are not swamped by more rambunctious neighbours. However, once established, the great length of the leaves means that the plants can take up a lot of sideways space and might well smother smaller neighbours. Sporobolus is a slow growing grass that takes about three years to fully mature. It is well worth the wait since mature clumps are spectacular. Mature clumps can live for decades without the need for division. It is possible to split plants when they are actively growing, but divisions can take a long time to establish. Though it produces an abundance of seeds, it is not known to seed invasively, as small birds and other wildlife find the seeds a nutritious food source. No serious pests or diseases are known to effect this plant. As soon as the winter starts many people suddenly feel the need to trim plants to a height just above the ground. However, specifically in winter many grasses are a joy to look at. Leave foliage and flowers for winter effect. In early spring cut back old stems to 10cm (4in) from the ground before growth resumes. Perennial Borders, Naturalistic planting schemes, Flower arrangements, Low Maintenance, Containers, Specimen plant. Sporobolus is a cosmopolitan genus of more than 160 species that grow in tropical, subtropical, and warm-temperate regions throughout the world. Seventy-four species are native to the Western Hemisphere. Sporobolus heterolepis is native to North American prairies and occurs naturally from Canada to Texas. Here it used to dominate many thousands of square miles, but has been much reduced through overgrazing or the ploughing of the prairie for wheat production, so now it is only found in undisturbed prairies. Sporobolus heterolepis grows in lowland and upland prairies, along the borders of woods, roadsides, and swamps, and in north-facing swales. It is restricted to the Flora region and is associated with many plant communities. It is also available commercially as an ornamental. Sporobolus is one of the few grasses whose fruit is an achene (a fruit) and not a caryopsis (a grain). 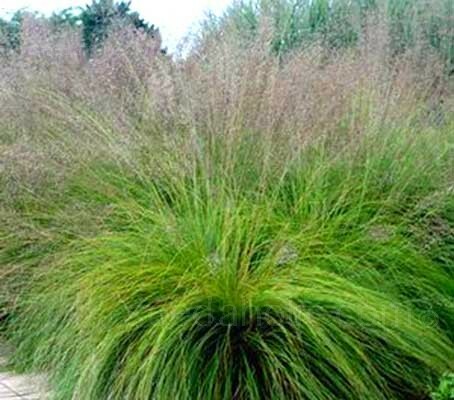 Quite unique, they are among the most distinctive of all grasses. They are not only globose (globe-shaped), but also have a tiny, string-like, vermiform (worm-like) appendage on the pericarp. The seeds are edible and nutritious and were used as food, to make flour by the Chiricahua Apaches. Birds and other wildlife depend on this plant as a nutritious food source. The genus name is derived from the Greek words sporos, meaning seed, and bolos, meaning throw, referring to the dispersion of seeds. The species name Heterolepis is from the Greek hetero meaning dissimilar and lepis meaning a scale, so meaning ‘different scales’. Members of the genus are commonly called Dropseed or Sacaton grasses. This plant gets its common name of Dropseed from the way the tiny mature seeds drop to the ground in autumn. Easily grown in average soils. Good drainage is important.